It’s a common scene in action movies: A car is racing down the highway, perhaps engaged in a high-speed chase, when there’s a crash and the car explodes in a giant ball of fire. Car fires make for a dramatic moment on film, but they are absolutely terrifying in real life. Vehicle fires can have a wide range of causes and tragic consequences. Oakland car fire lawyer Greg Brod works to get the victims of car fires compensation from those responsible. His team can help uncover the cause of a car fire and use the law to recover money for the injured and/or the grieving. As KPIX reported, car fires consumed two police vehicles over the most recent weekend. Per the article, the first such incident occurred late Saturday when an Oakland officer was chasing a carjacking suspect on I-580 near the High Street exit. In an attempt to avoid hitting another vehicle, the officer crashed into a pole. His vehicle burst into flames but, thankfully, he was able to escape and his colleagues were able to capture the carjacking suspect. A second police vehicle fire occurred on Sunday afternoon when two police cars crashed during a chase on 38th Avenue. According to the National Fire Protection Association (“NFPA”), between 2006 and 2010, fire departments in the U.S. responded to an average of around 152,300 automobile fires each year. On average, these fires led to 209 civilian deaths and 764 civilian injuries in addition to $536 million in direct property damage. 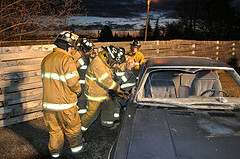 Taken another way, that’s an average of 17 vehicle fires reported each hour and four deaths in vehicle fires each week. What causes vehicle fires? The NFPA reports that roughly two-thirds of vehicle fires involved mechanical or electrical problems. While collisions and overturns were factors in only 4% of all vehicle fires, those fires accounted for a startling 60% of vehicle fire deaths. Likewise, a mere 2% of automobile fires originated in fuel lines or fuel tanks, those fires accounted for 15% of vehicle fire fatalities. If a car fire leaves you or someone you love seriously injured, it may be difficult to determine who is at fault. Our car fire law firm in San Francisco, Oakland, and Santa Rosa partners with experts to figure out what caused a particular car fire. Whether fault lies with another driver, a faulty repair job, or a vehicle defect, we can then use the law to hold those responsible legally and financially accountable to you and your family. In most vehicle fire cases, like in most personal injury cases generally, we are able to reach a financial settlement without the need for a full trial. Still, we are always prepared to go to trial if necessary. Remember, evidence can disappear quickly after a vehicle fire or other tragedy. The sooner you call our office, the better equipped we will be to represent you and advocate on your behalf. Always make taking care of your health and that of your loved ones priority number one after an accident or fire, but call us as soon as possible. Do not rely on your insurance company to conduct a full, fair, and unbiased investigation and do not trust the insurance company to advise you of your rights. A consultation with our experienced Northern California car fire attorney is free and the vast majority of our cases are handled on a contingent fee basis so you pay nothing unless you receive compensation.